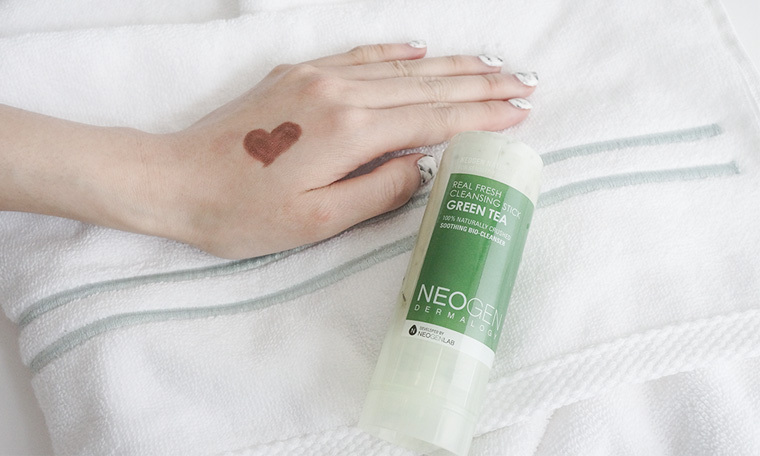 We’re so excited to announce the Neogen Green Tea Cleansing Stick won the 2017 Teen Vogue Acne Award! Read on to hear about how Charlotte made this award winning cleansing stick! 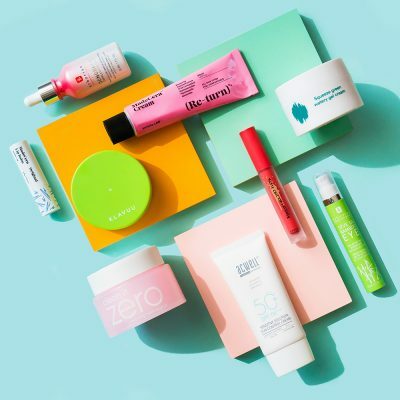 One of the most frequent questions we get at Soko Glam is “what skincare products do you recommend for traveling?” Or “how do you bring your 10 step skincare routine to the gym?” I realized that even after I introduced the Su:m37 Miracle Rose Cleansing Stick back in 2013 through the Soko Glam curation, there aren’t many other options out there when it comes to travel-friendly cleansers. That’s why when I was approached by Neogen to create a new skincare product (I’m super lucky, I know! ), I decided that I wanted to make a cleansing stick. I travel 1/3 of the year so I personally was invested in created a travel-friendly skincare companion. And I know that I’m not alone. I believe our generation has embraced traveling and do it often, whether it’s a quick 48-hour trip to seal a business deal or to spend a well-deserved week at a secluded beach for some R&R. Also, I’ve realized that many of my friends and people who love Soko Glam and K-beauty are not only good to their skin, but they are fairly good to their bodies. Working out is a priority in their schedule, so I wanted to make a product that would be ideal for everyday use—i.e. throwing into a gym bag for their cycling class on Monday and their SLT workout on Thursday. Now after over a year in the making, meet my latest skincare project: the Neogen Green Tea Real Fresh Cleansing Stick. I’m excited to finally announce it on The Klog and share all the behind-the-scenes stories about how this product came to be! While I love the Su:m37 Miracle Rose Cleansing Stick (and clearly I’m not the only one as it is one of the most popular products on Soko Glam), I wished there could be some improvements to the stick. Number one, I wanted a cleansing stick with a lower pH, to prevent any dryness and tightness in the skin after use. Also, I wanted to make the cleansing stick more effective at removing makeup so that when I was traveling, I wouldn’t necessarily have to pack an oil cleanser with my water based cleanser. The cleansing stick should be able to do it all and do it well. 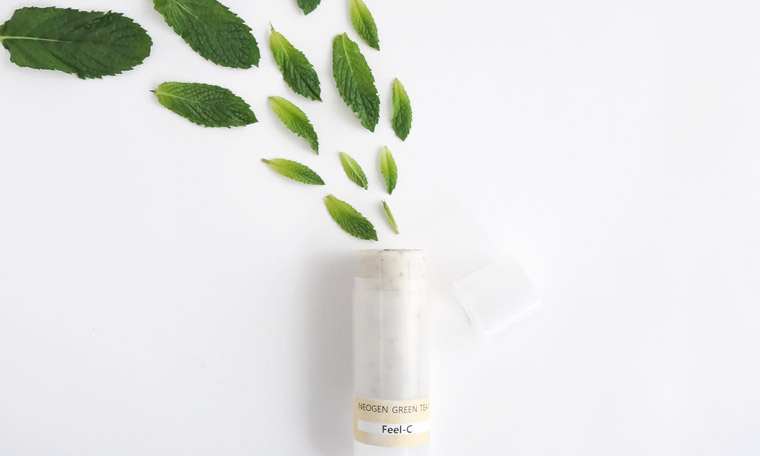 Lastly, most of you know that I’m obsessed with green tea and how it tackles premature aging along with inflammation and acne, so green tea was easily selected as the main ingredient for this cleanser. As I have done in the past (i.e. Manefit Natural Gift Green Tea Pore Care Sheet Mask), my collaboration products launch first without publicly revealing that I have worked on it. 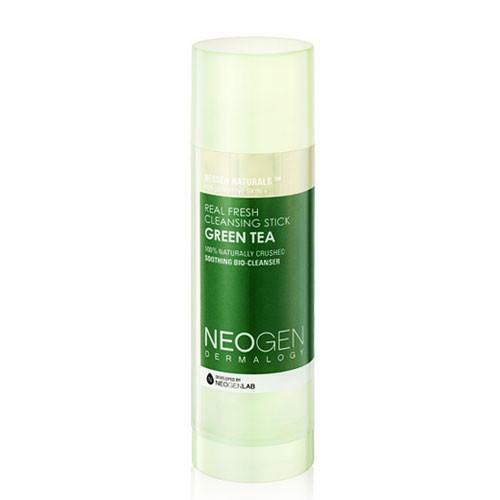 The Neogen Green Tea Cleansing Stick was actually launched in Korea first a few months ago and was sold in the country through Olive Young and online retailers without a peep from me. I’ve been sneaky about this because I wanted to get real feedback from real customers and make adjustments from there. 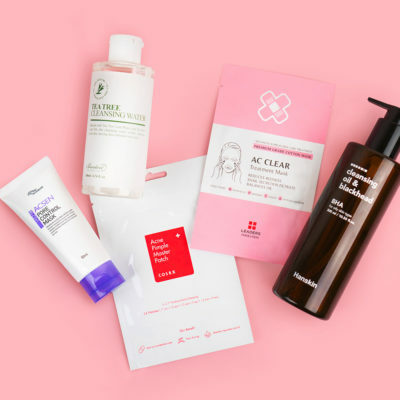 The funny thing is that some of you, K-beauty junkies based in the U.S., were so excited about the cleansing stick you found in Korea that you actually reviewed it on your social channels, which was actually very helpful to hear. 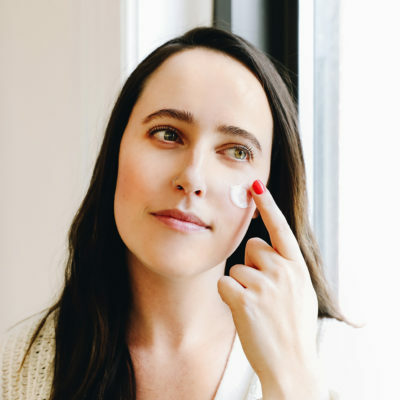 Internally, we did several rounds of testing amongst total skincare newbies in the U.S. as well, because I wanted feedback from people who would pick up the product at random. Then we iterated and then iterated the product some more. Now that we’re happy with the final adjustments, we finally decided to officially launch it here! Here’s a tip: you can tell that it’s the latest version of the cleansing stick if you see my signature on the side of the packaging and has pink-colored leaves! It took several iterations, but we were finally able to get the pH of this cleanser to a 5.5-6. For those of you who are new to pH’s of cleansers, it’s important to have low pH, rather than high, because high pH tends to dry out the skin and give off a tight, unpleasant feeling. With the technology of Korean skin care nowadays, there is more focus for low pH cleansers that can do a great job cleansing, which I am totally onboard with. 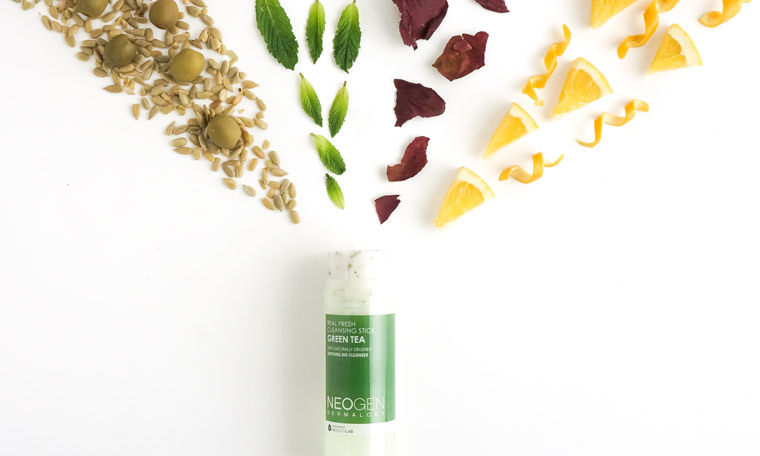 Coconut Oil, Olive Oil & More: The Neogen Real Fresh Green Tea Cleansing Stick is special because of the ingredients. One of my first priorities was to fill it up with yummy, natural oils to break down makeup and other oil-based impurities. Here’s how serious I was about oil content in the formula: Out of 22 ingredients, 13 of them are natural oils and I’ve bolded the oils below in the ingredient list below. 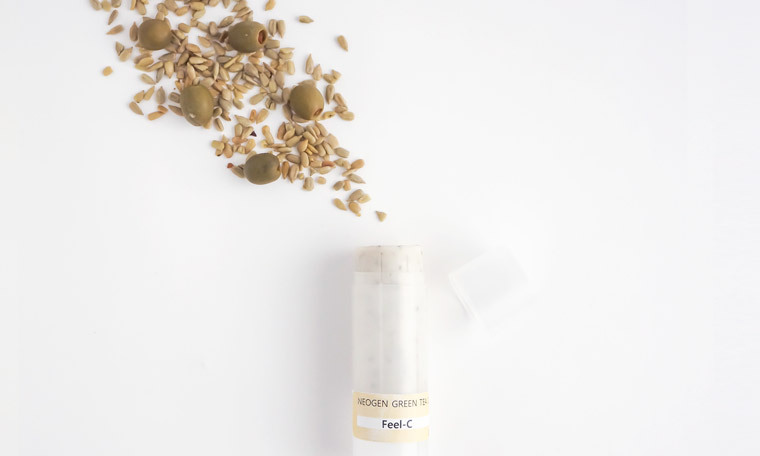 Oils from various natural products such as coconut, olives, and sunflower seeds were core ingredients in the development of the cleansing stick. 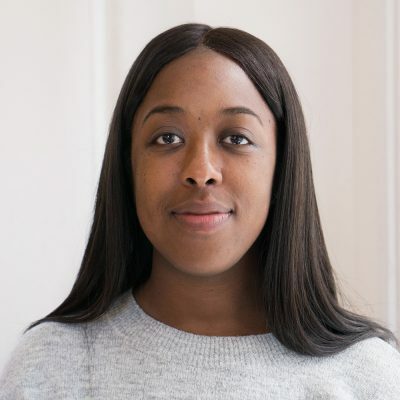 I am convinced that double-cleansing is one of the most effective ways to prevent breakouts, so I wanted the cleansing stick to be a multi-tasker. In other words, if you’re traveling and want the most efficient cleanser, the Green Tea Cleansing Stick will remove makeup and do the job of cleansing your skin thoroughly as if you had done the double cleanse. The ingredient list: Glycerin, purified water, cocos nucifera coconut oil, palmitic acid, stearic acid, lauryl betaine, betaine, camellia sinensis leaf, camellia sinensis seed oil , camellia japonica seed oil, olea europaea (olive) fruit oil, helianthus annuus (sunflower)seed oil, limnanthes alba (meadowfoam)seed oil, oenothera biennis (eveningprimrose) oil, tocopheryl acetate, citrus aurantifolia (lime) oil, ocimum basillicum (basil) oil, cananga odorata flower oil, citrus limon (lemon) peel oil, origanum heracleoticum floweroil, citrus aurantium dulcis (orange)peel oil, fragrance. Coconut oil, olive oil and 11 other yummy oils in action that helped gently remove my makeup! Green Tea: Another ingredient highlight is, of course, the whole green tea leaves that have been crushed and put into the formula for that extra skin softening exfoliating effect. I chose green tea, because as I’ve mentioned before, it’s a tried and true ingredient. Out of all the ingredients out there, this has been proven to be effective against signs of premature aging and no one can mess with those studies! I also love how after every use, the green tea bits dry up nicely and give you the maximum exfoliation. Although I love rose petals (especially the aroma of them), my biggest pet peeve was that the petals ended up getting too mushy in the formula and often times don’t end up exfoliating! 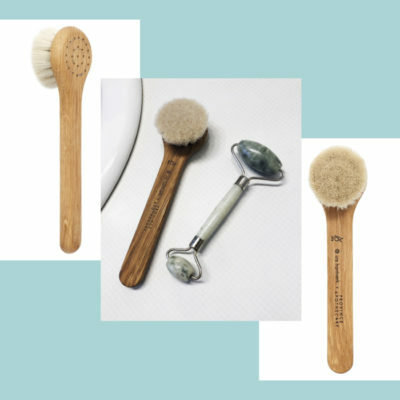 So I was glad the green tea is so finely milled, that they would quickly dry up to provide some exfoliating oomph to them every time I used it. Evening Primrose: And, a special nod to the evening primrose oil. It’s one of my favorite ingredients because of it’s proven ability to soothe and calm skin. With so many sensitive skin types out there, anti-inflammatory ingredients was a priority for me. 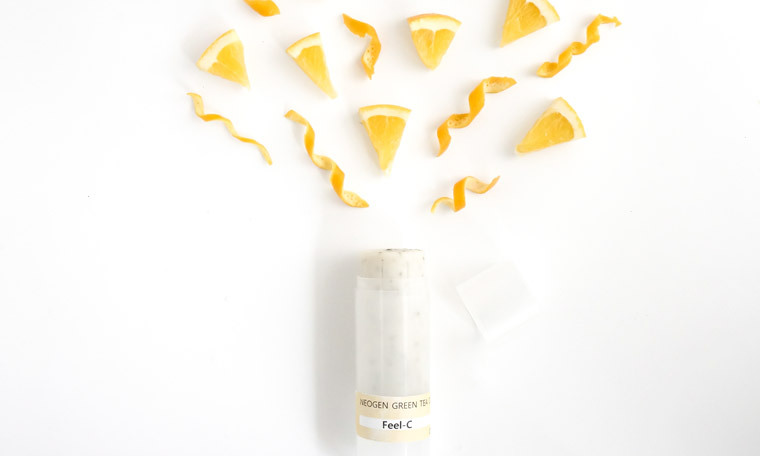 There are some natural skin brighteners in it as well, thanks to lemon peel oil and orange peel oil. Scent: I wanted the fragrance of the cleanser to be sensorial without being overpowering. Because green tea doesn’t technically have a powerful scent (it’s more neutral than anything), we needed something with more power that would unify the natural scent of the formula, I went for a fragrance that has a slight rose-ish, floral scent which I feel has aromatherapeutic qualities to it. 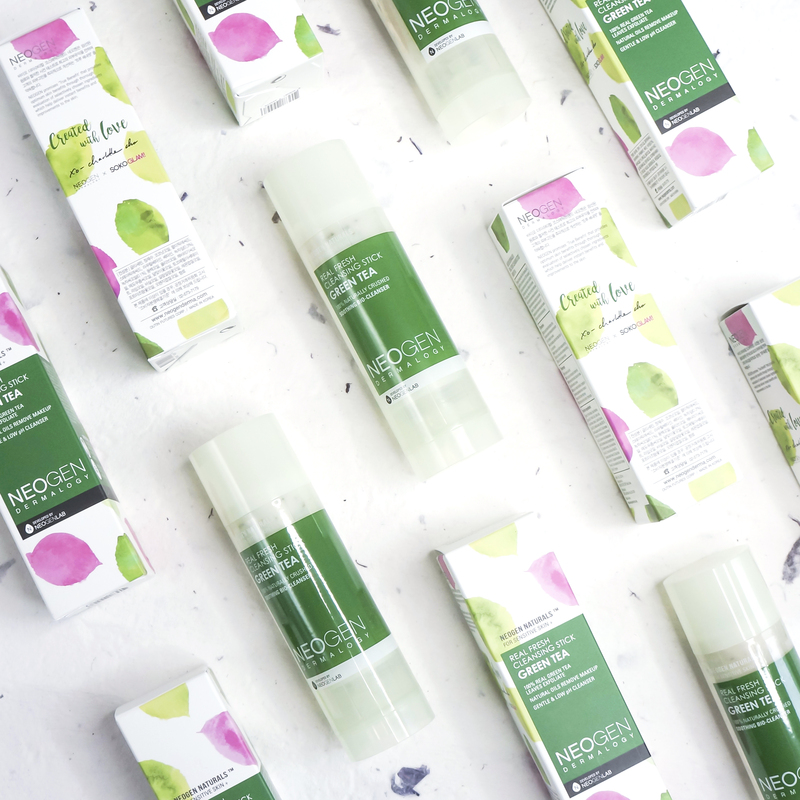 So there you have it: the Neogen Real Fresh Green Tea Cleansing Stick! This is a travel-friendly cleanser that breaks down makeup with natural oils, exfoliates gently with green tea leaves, and has the overall effect of a double cleanse. Plus, it’s super gentle on your skin thanks to the low pH level! 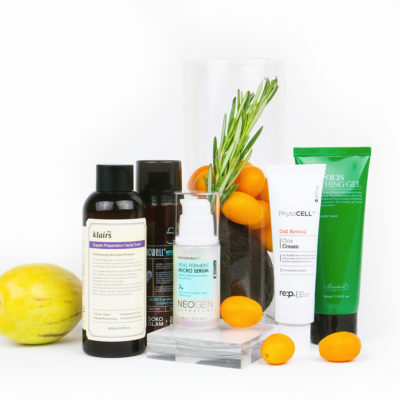 The goal here is to have soft, clean and radiant skin, as it is always with any really great skincare product. 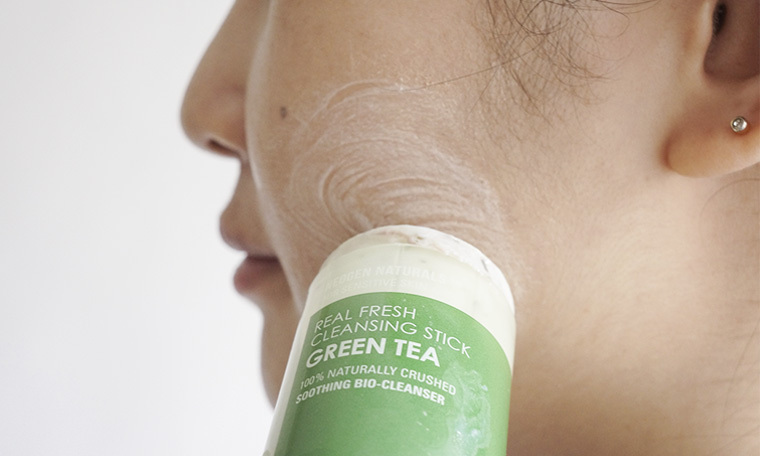 By the way, there is actually a reason why there aren’t many cleansing sticks on the market. It’s incredibly difficult to make it and there is only one lab in Korea that can manufacturer it well! I’m super fortunate to be able to create a cleansing stick with Neogen, one of the most innovative Korean beauty companies out there. And the great thing about this collaboration is that the cleansing stick is never really truly finished. Based on your feedback, we can make further tweaks to the formulation, so keep your comments and feedback coming! At the end of the day, beauty should always be fun and collaborative, so always, thank you for your interest and support in me and for the Neogen Real Fresh Green Tea Cleansing Stick!